Malik S. Khan knows a thing or two about Mediterranean and Indian cuisine. After 22 years of cooking up chicken tikka masala, naan, kebabs and gyros, he’s nearly perfected his craft. 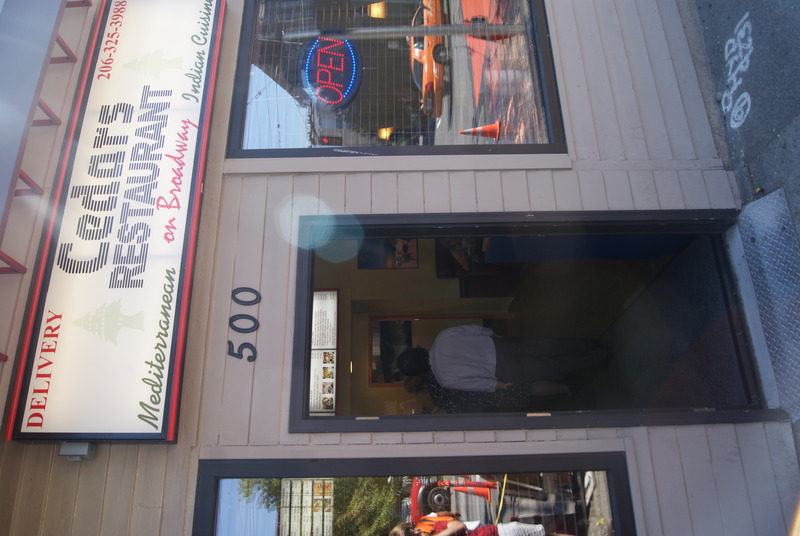 Already a hit in the University District (receiving Seattle Weekly’s 2011 vote for best Indian restaurant in the city), Khan decided to open up a new location of his popular Cedars Restaurant. Lucky for us, that new location happens to be on Broadway. Tucked away in a small storefront on the corner of Broadway and Jefferson, the new Cedars Restaurant quietly opened up last week. Business is already booming—lines have stretched to the door at lunch hour nearly every day since its opening. “A lot of students and medical staff don’t have good food around to eat—we want to provide good food and good value to the people around here,” Khan said of the new location, situated neatly next to Seattle University and Swedish hospital. Khan decided to open a new restaurant in the area roughly six months ago after eying the densely populated area with a notable lack of food options. His family cheerily helps run the business, and are still trying to get the word out about the new storefront. “People are still calling here for delivery thinking this is the other store,” Khan’s wife laughed during a busy lunch hour rush. Cedars offers an array of perfectly spiced and proportioned Mediterranean and Indian cuisine. The gyros are huge, full of tender, seasoned meat, and just the right amount of tzatziki and tahini. Running anywhere from $4 to $7, they won’t break the bank either. The Indian selection runs from mainstays like Tikka Masala, to mango curries and Tandoori cooked meats for $10 to $12. Vegetarians won’t feel left out either, the menu is full of meatless options that don’t sacrifice any of the flavor. On top of it all, Cedars delivers, so you can have the delicious brought to you by calling 206-325-3988. Mmmm i love Cedars in the U. I’ll be hitting this one fo sho. anyone tried the new location yet? Is it the one on Brooklyn (indian) or the one on 43rd (mediterranean)? Or are those two related? The former was always way better than the latter, but haven’t been to either in years. HELL YES! Cedars Indian food is so good! Delicious food at the one on Brooklyn! I lived in the U ten years ago and went there quite often. I spoke with the owners before they opened last week (I work at Harborview) and they promised the same delicious food. Also, they are planning on expanding to a pizza place next door where a convenient store now is. The owners of Cedars owns the building. Re: Which One. I assumed they were two separate places back in my days in the U. Cedars on Brooklyn was always better food, by far. There are shockingly few good lunch places within a short (<10 min) walk of Harborview (which is where I work.) I've already been by once and will certainly be there at least once a week from now on. Excellence on a Plate. No arguments there. When my husband and I were first married we lived on 12th and Brooklyn in U-Dist. We had dinner from Cedars at least twice a week and never tired of the fresh flavors and wallet-wise portions! I hope Capitol Hill embraces the new venture! cedar’s food is great! only bad part about their restaurant is that the employees don’t get to keep their tips… and yet the employees are always very cheerful.